There’s a few different things in the queue for a blog post. I need to write my 52 Ancestors post for this week, and I have some news to share about my research into Joseph D. King. For now, though, I’m just going to follow up with the translation of the German document I posted last Friday. 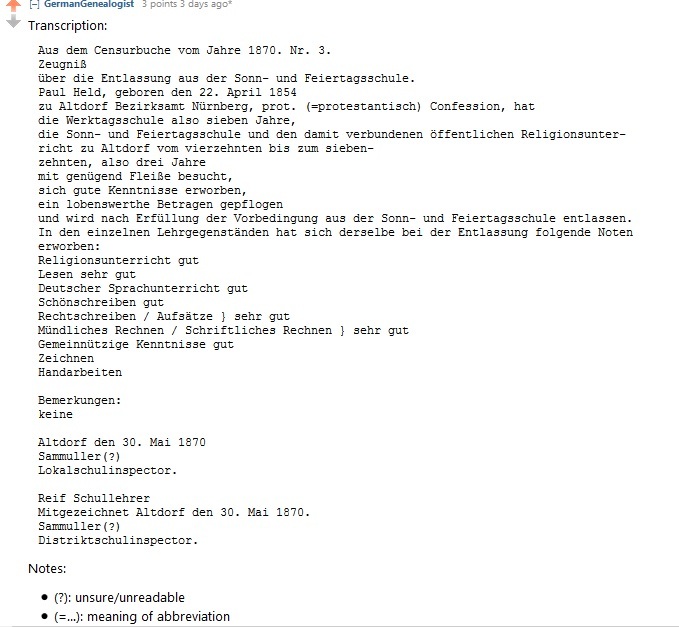 I posted a link to the blog entry on /r/genealogy, and a Reddit user by the apropos name of GermanGenealogist provided a transcription and translation. You may already know this, but it gives me, at least, the first specific information about where Paul Held came from (or at least lived at some point as a child/youth): Altdorf near Nurenberg (in southeastern Germany). The document is a kind of graduation certificate. It documents that for 7 years, from age 7 to age 14, he attended “Werktagschule” (school held during the working week, which would have been Monday through Saturday), and that from age 14 to age 17 he attended “Sonn- und Feiertagschule” (school held on Sundays and holidays; at age 14 he would have started working during the rest of the week). 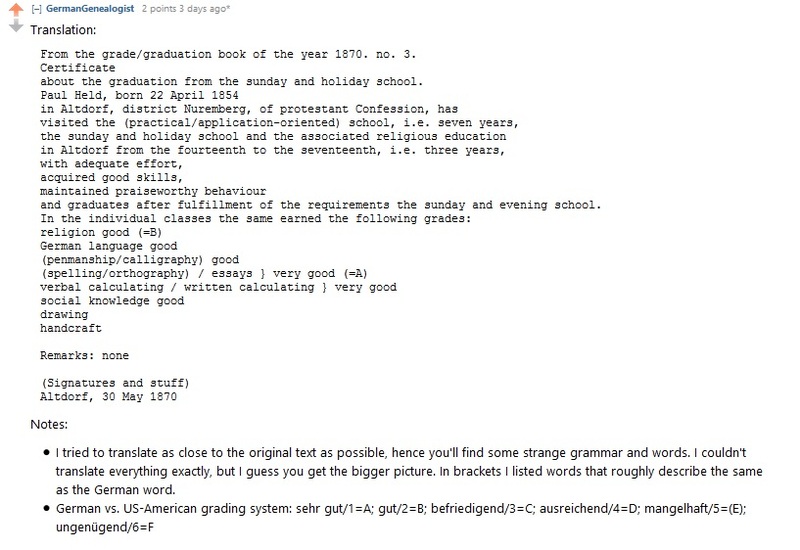 It shows the subjects he learned and how he did in each subject. Because this included religious instruction, the document notes that he is protestant. That might help figure out what church he might have attended and therefore where baptismal records and the like may be, or where his family and ancestors are buried.